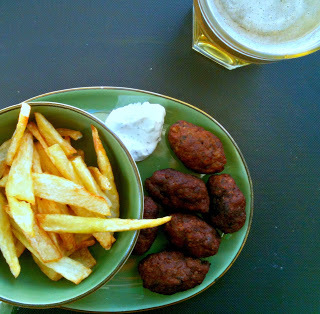 Meatballs: the Cyprus way ! Meatballs or “keftedakia”, as we call them in greek, reminds me of my childhood. My grandmother used to make them with fried potatoes. My grandmother cook the keftedakia the greek way ( her recipe will follow in a few days) but when I met C. he told me that in Cyprus they eat another version of keftedakia. I must admit that the cypriot version is lighter to the stomach than the greek one. Nonetheless , i love food and like both versions! If you haven’t taste them yet try them they are really tasty and aromatic! 1. In a large bowl, put all the ingredients and knead them very well for 10 minutes. I believe that the secret of the good meatballs. Set the bowl in the frigde for a couple of hours. 2. Roll the meatballs and form small spheres. Heat the olive oil in a medium frying pan and put the first batch of meatballs. Make sure that you put no more than 10 meatballs each time. The meatballs are ready when they are golden brown. 3. Serve them immediatelly with fried potatoes and a chilled tomato and cucumber salad. They taste great also dipping them in yoghurt!